Author(s) Ekkekakis, Panteleimon; Russell, James A. The role of affective constructs in human behavior in general, and health behavior in particular, is recapturing the attention of researchers. Affect, mood, and emotion are again considered powerful motives behind dietary choices, physical activity participation, cigarette smoking, alcohol over-consumption, and drug abuse. However, researchers entering the fray must confront a vast and confusing theoretical and technical literature. The enormity of this challenge is reflected in numerous problems plaguing recent studies, from selecting measures without offering a rationale, to interchanging terms that are routinely misconstrued. The Measurement of Affect, Mood, and Emotion cuts through the jargon, clarifies controversies, and proposes a sound three-tiered system for selecting measures that can rectify past mistakes and accelerate future progress. 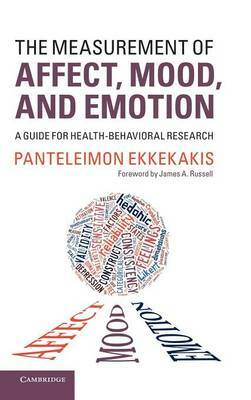 Panteleimon Ekkekakis offers an accessible and comprehensive guidebook of great value to academic researchers and postgraduate students in the fields of psychology, behavioral and preventive medicine, behavioral nutrition, exercise science, and public health.